It's show time folks! Set out for your favorite freshwater fishing spot and apply these crappie fishing techniques if you wish to have many successful outings on the water. It requires a bit of skill and sometimes patience to bang out a mess of papermouths to fill up that ice chest. Crappie can be caught with a variety of methods. Picking the right time to utilize the different crappie techniques will surely have you fishing like a master angler. Although crappie are a heavy schooling fish, you will be schooling these spunky fighters when they begin slamming your presentations! 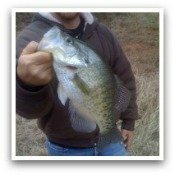 One of the most common and extremely effective crappie fishing techniques is with using live crappie bait. Small minnows or worms are great producers. Many people believe that if you hook a minnow through the mouth then they will last longer. My question is... longer than what? The minnow will be unable to breath if it's mouth is hooked shut, right? Therefore, hook it behind the dorsal fin, being careful not to penetrate the lateral line. 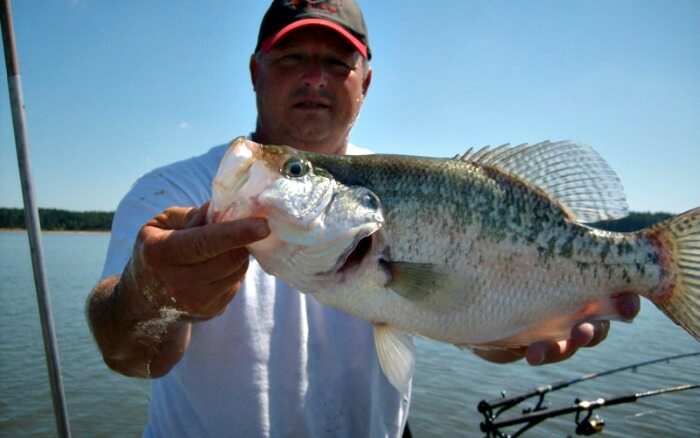 With a minnow or worm baited up, toss it out where the crappie are and allow it do its thing. A bobber will be perfect to use when the fish are suspended higher up in the water column. Adjust the bobber as needed to get it right in front, or ever so slightly above them. If it's too far above or below them then they may not want to exert the energy to go after it, unless they're roaming around. Throwing artificial lures are also deadly crappie fishing techniques. Small and lightweight lures such as 1/16 to 1/8 ounce jigs, inline spinners, grubs and tubes are just a few nice choices to fool these excellent seeing crappie. You can add plastic trailers to the jigs if you wish to. Experiment with that and different colors. Even when the crappie are biting well, continue to switch out the colors to keep the fish interested. Simply cast and retrieve the lure where you have found the crappie. Vary your cadences until you determine how they like it best. You can also use a bobber float with these lightweight lures. This will allow you to get the lure to set at the exact depth that you know the fish are holding at. Let the lure set and twitch it a little every few seconds. Stay alert and be ready to set the hook with the slightest movement of the bobber. Trolling is one of the trickier crappier fishing techniques to master for some of the less experienced anglers. One of the main things to keep in mind is not to be a troll when trolling. My favorite tactic for trolling is with the importance of boat position. One way is to position the boat in line horizontally over a steep drop off. This is often best with a fishing buddy on board, although not entirely necessary. While holding out your fishing rods, let out your line on each side of the boat, one in the shallow section, and the other in the deeper section of the bottom of the drop off. Steadily troll slowly through the schools of bait fish and/or crappie. You can continue trolling even when you hook up so that you don't have to restart the whole process each time. Maneuver around and make several passes when you have found a school of these little giants. These are just a few of the most efficient crappie fishing techniques that will help you to determine how to catch crappie consistently. You might also be interested in experimenting with other crappie fishing methods as you gain experience. You can try drop shotting with a variety of baits, trolling at various depths or speeds, flipping and pitching different lures in and around all types of structure, fly fishing, or even ice fishing if you can get to lakes that are frozen over.